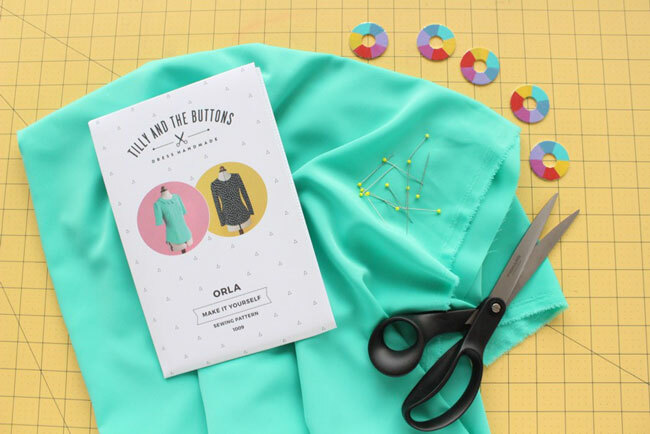 Making the Orla sewing pattern? We’ve talked about choosing fabric, selecting your size and making simple pattern alterations, and adjusting the bust, back and shoulders. 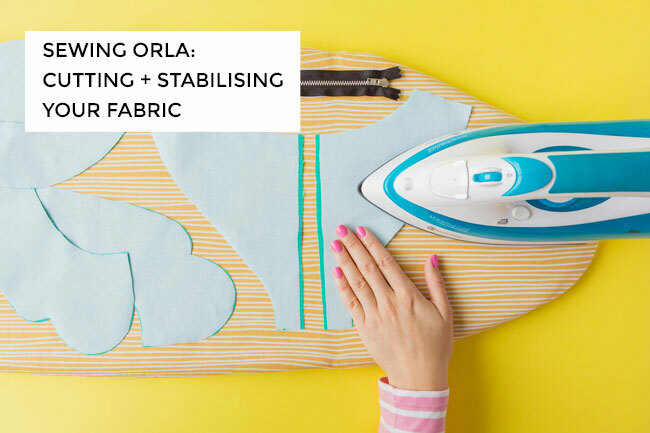 Today we’re going to talk about cutting out and marking your fabric, and stabilising it with stay stitching and interfacing. For some people, the cutting out stage is an inconvenience that’s delaying you from settling down at the sewing machine. But for me it’s the most exciting bit! I love the promise that a flat piece of fabric holds, and the thrill that comes from making that first slice with the scissors. Let’s do this! It’s important to wash and dry your fabric before you cut into it. Fabric often shrinks in the wash, so much better to get shrinkage out of the way before you start cutting, otherwise your top could end up too tight. If it’s creased, give it a press once it’s dry. 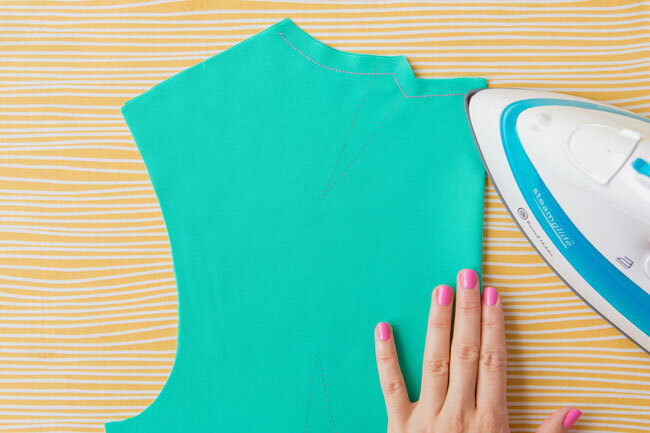 Test the iron setting on a corner of the fabric first to check you don’t scorch it. 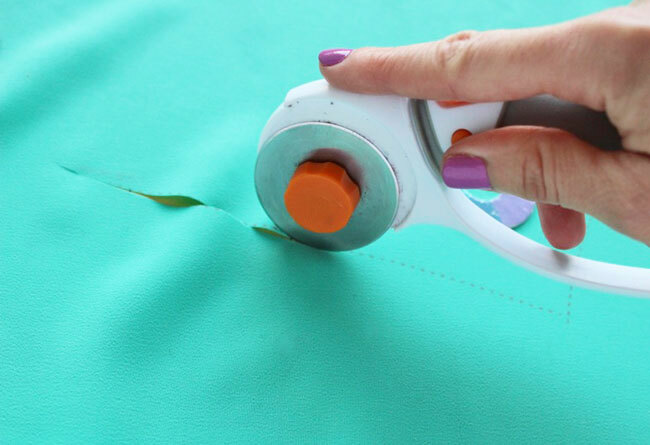 When you’re ready to cut the fabric, clear the largest space you can on a flat surface – ideally a table, with a cutting mat on it so you don’t scratch the table. You can get fold-out cutting mats for the floor if your biggest table is still teeny. 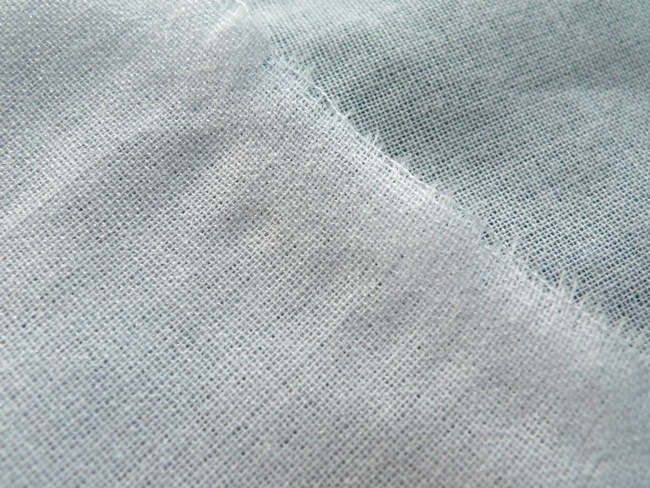 Fold the fabric in half lengthways, parallel to the selvedges (the finished edges), bringing the right sides together. 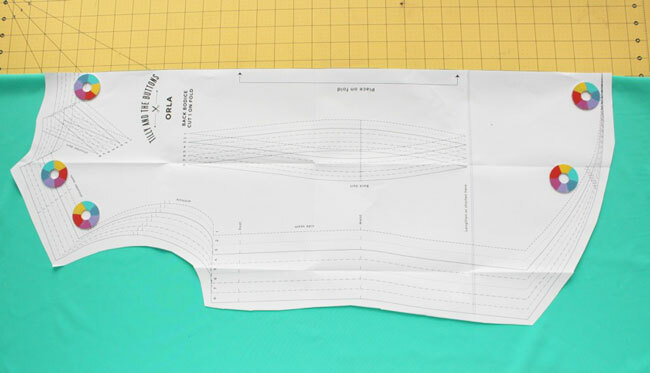 The “right sides” are the nice sides of your fabric that you want to show on the outside of the finished garment – we want the “wrong side” to be on the outside of the fold so that we can easily mark the darts on the fabric. 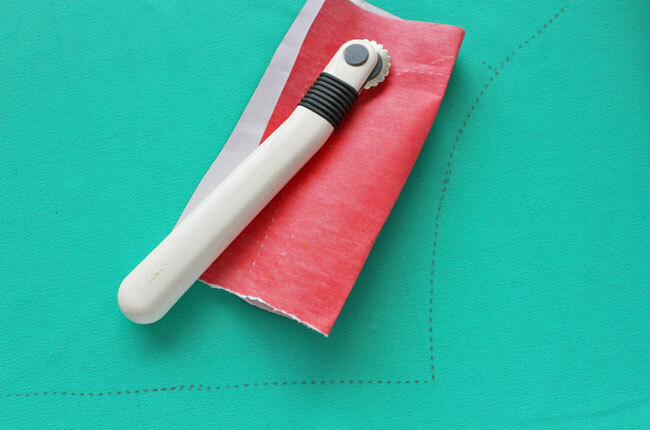 Lay the folded fabric down on the table, and smooth out any wrinkles. If your fabric is a bit slippery, you may find it helps to pin the selvedges together. 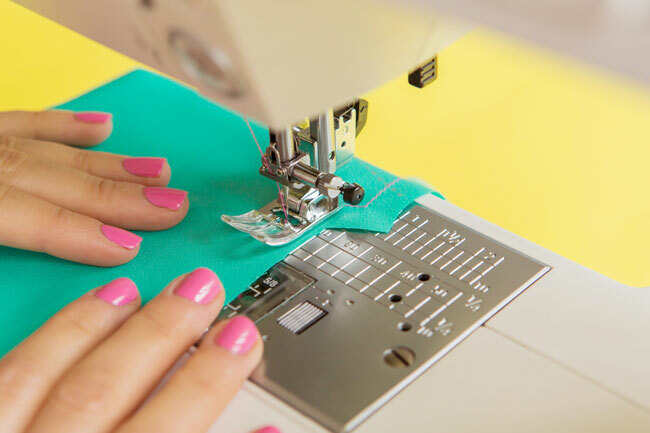 In fact, if your fabric is slippery, you may also want to read my tips for cutting and sewing slippery fabric. Open out the pattern sheets and cut roughly around each piece, leaving about 2cm (1in) of extra paper around each one. You can cut exactly along the straight lines labelled with double-hooked “Place on fold” arrows. Use paper scissors to avoid your fabric scissors becoming blunt too quickly. Now you can start placing the pattern pieces on the fabric. 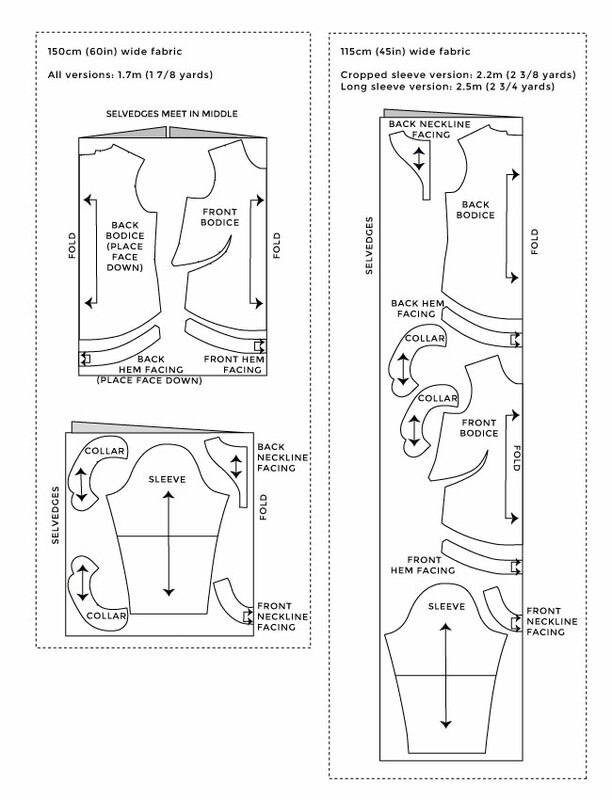 The cutting layout diagrams – above and included in the instructions – give a suggested layout which uses up a minimum amount of fabric. Depending on what size you’re making and how wide your fabric is, you might find a different layout that works better for you. As you can see in the diagrams, for narrow fabric you’ll need to place all the pieces with the fabric folded in half. If your fabric is wider, place the sleeve, collar, front neckline facing and back neckline facing pieces on fabric folded in half; then fold the rest of the fabric so the selvedges meet in the middle to cut the other pieces. If your fabric has a directional print, make sure you place the pieces with the design pointing the correct way, so it doesn’t end up upside down! 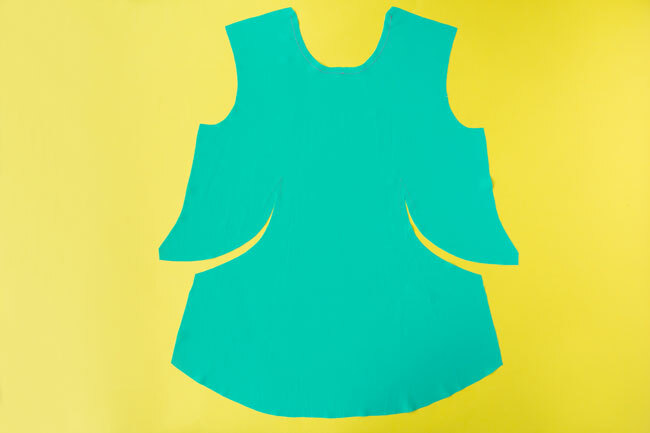 The front bodice, back bodice, front hem facing, back hem facing and front neckline facing pieces all have straight edges with double-hooked arrows labelled “Place on fold”. Line up these edges with the fold of the fabric and weigh down or pin in place. For the other pieces, line up the grainline arrows (labelled on the pattern pieces) so they are exactly parallel to the selvedges. To do this, stick a pin in one end of the grainline arrow and measure the distance from here to the selvedges or folded edge, whichever is closest. Now measure the same distance from the selvedges or folded edge at the other end of the arrow, and pivot the pattern piece from the pin until this end lines up with the end of the tape measure. Use pins or weights to hold the pattern pieces in place. Place the pins just inside the pattern lines in your size (in this example, I'm cutting a size 3, the solid line). Try not to use too many as they can distort the fabric. 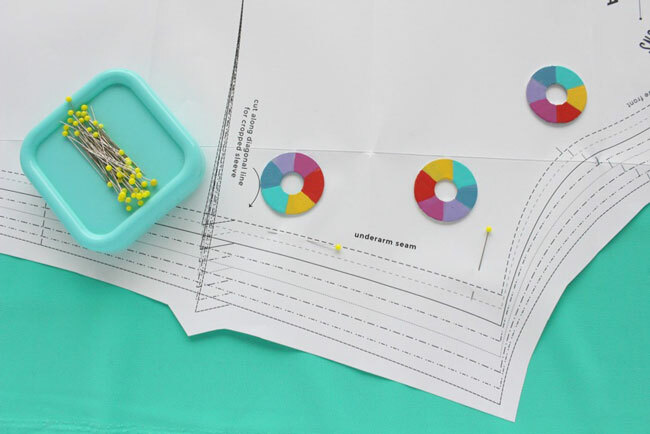 Alternatively you might want to try pattern weights – we’re using our snazzy rainbow painted washers, or you can use whatever you have to hand, such as tins or scissors, as make-shift weights. The pattern pieces tell you how many pieces of fabric to cut them in. 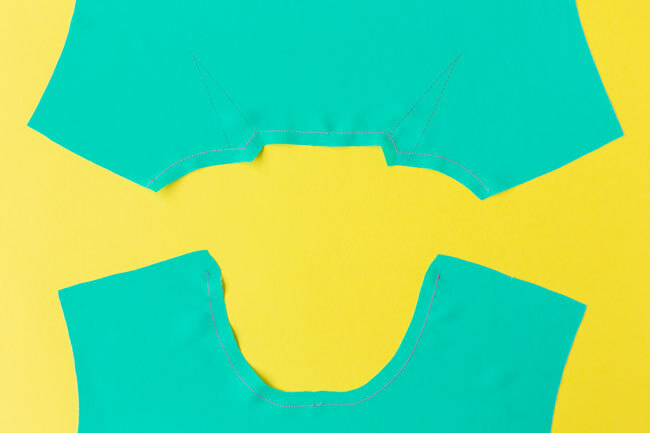 When we cut out the pieces placed on the fold, we’ll end up with one symmetrical piece double the size of the pattern. For the other pieces, we’ll end up with two separate pieces as they’re on two layers of folded fabric. If you’re making the collar, it says to cut four pieces – so you need to cut it out twice. Find your pattern size lines – these are marked with a particular style of dashed, dotted or solid line as well as numbers. My favourite way of cutting out fabric is to trace the outer lines onto the fabric first using dressmaker’s carbon and a tracing wheel. 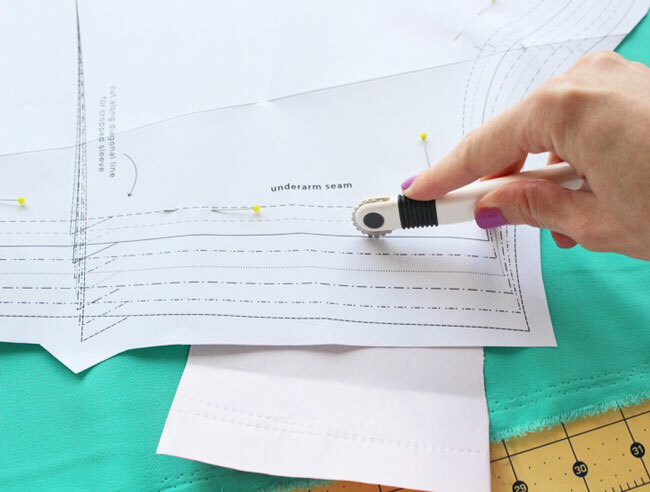 Alternatively, if you don't mind cutting up the pattern, you can cut through the pattern lines and fabric on your size lines using scissors or a rotary cutter. If you’re making the cropped sleeve version, trace off or cut at the cropped sleeve cutting line. The side seam juts out in a diagonal line at the bottom - this is so when the seam allowance is folded back, it's the same width as the bit of fabric it will be stitched to. 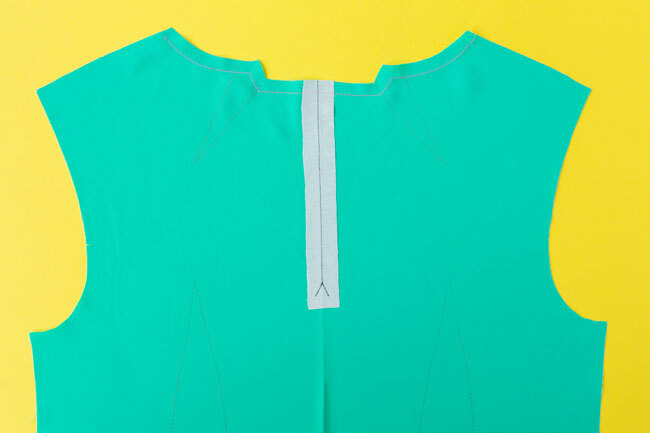 Trace off the bottom of the back neckline facing at the cutting line labelled with the length of your zip (measure the zip between the metal top stop and bottom stop). If your fabric is particularly slippery, you may find it easier to cut the smaller facings and collar in interfacing first (see below). You can then fuse them to the fabric to stabilise it before cutting them out. Remove the pattern pieces and then hold the two layers of fabric in place again with pins or weights. If you traced the pieces with dressmaker’s carbon, carefully cut through the outlines using fabric scissors or a rotary cutter. Cut short snips for the notches (about 5mm / 1/4in). The notches will help you pin the pieces together accurately later. Snip an extra notch on the front bodice at the top of the centre fold. 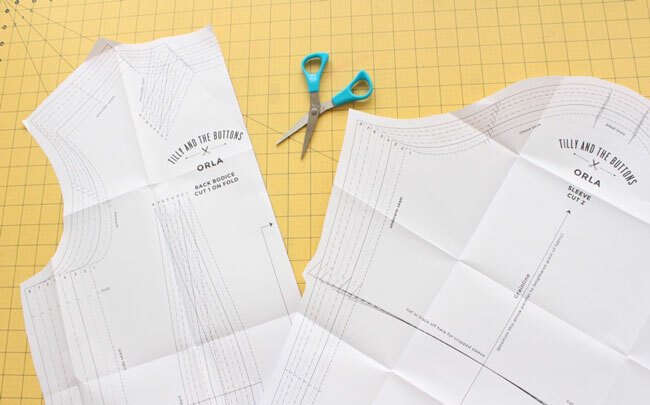 Cut interfacing using the pattern pieces for the front and back neckline facings, and two symmetrical collar pieces if you’re making it. Also cut one piece using the zip interfacing pattern piece (you only need to cut this in interfacing, not fabric) – this will stabilise the zip opening on the back bodice. Trim 5mm (1/4in) off the long straight edge of the interfacing for the back neckline facing – this will make it easier to press the seam allowance under later. If your fabric is particularly lightweight, you might also want to trim the seam allowance off the collar interfacing too – but this isn’t essential. The seam allowance on the collar (and the rest of the pattern apart from the zip opening) is 15mm (5/8in). Mark the zip opening line (including the upside down “V”) on the zip interfacing piece, and mark the stitching pivot points on the collar interfacing. One side of iron-on interfacing has teeny little blobs of glue on it which feel a little rough – draw the markings on the other side. To apply the interfacing, place the glue side face down on the wrong side of the fabric and hold a hot, dry iron on top for a few seconds. 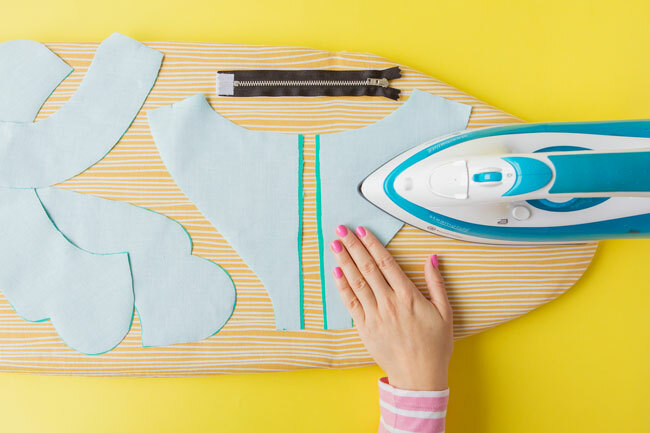 Be careful not to move the iron back and forth – just lift it up and down – otherwise the interfacing can squidge up into a sticky mess. And take care not to let the glue side touch your iron or ironing board! 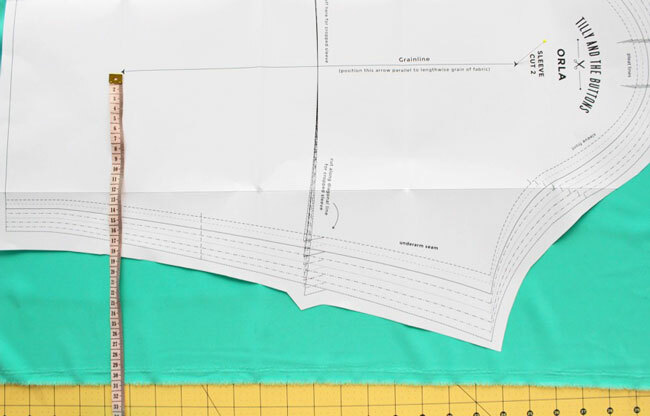 Apply the interfacing to the front and back neckline facings – remember you trimmed some off, so the long straight edge of interfacing should be 5mm (1/4in) in from the fabric edge. If you’re sewing the collar, apply interfacing to two symmetrical collar pieces too. Cut another rectangle of interfacing big enough to fold over and cover the loose ends at the bottom of the zip tape, and carefully apply it with the iron. This will make it easier to secure the bottom of the zip to the bodice later. We’re going to “stay stitch” the neckline on the front and back bodice. Stay stitching is simply a line of stitching on a single piece of fabric, just inside the seam allowance. What it does is help stabilise a curved or diagonal cut line that might otherwise stretch out of shape when we’re handling it. 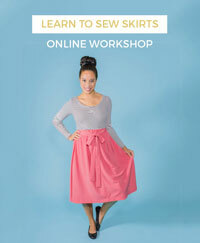 Stay stitch the neckline on the front bodice and back bodice by sewing a line 10mm (3/8in) from each raw edge. Start at one shoulder and sew to the centre; then sew another line from the other shoulder to the centre. Sewing from the outside in will help prevent the neckline from stretching out asymmetrically on the machine. I’m using contrast thread in most of these step photos so you can see where the stitching lines are. 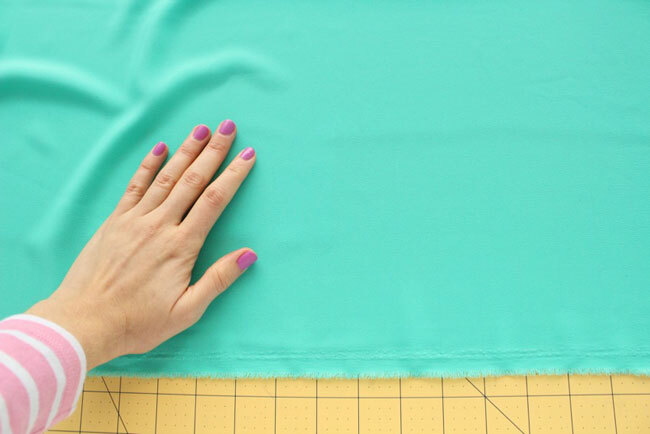 You’ll probably want to use thread that matches your fabric so you don’t see it! You might be wondering whether you should stay stitch the curved lines on the bust darts too. Personally I wouldn’t because the stitching can add bulk, and the bust darts aren’t a great place for that. We’ll sew them up in the next post anyway, so hopefully they won’t stretch out before then. The last step for today is to apply the zip interfacing to the back bodice. 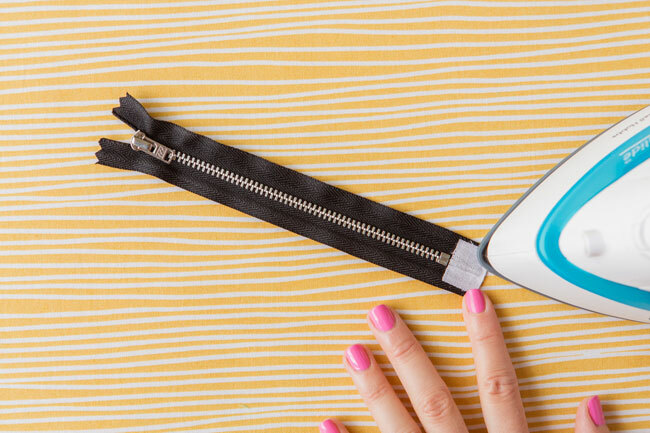 This will help strengthen the seams from straining by the relatively heavy zip. We’re doing this last so we can cut through the interfacing later without cutting through the stay stitching threads (the interfacing will hold them in place). Find the centre back line of the back bodice piece – the way I like to do this is by folding the back bodice in half lengthways and lightly pressing the fold. Unfold it and apply the zip interfacing to the wrong side of the fabric, lining up the zip opening line marked on the interfacing with the pressed centre line on the bodice, the upside down “V” towards the bottom, and the other short edge lined up with the neckline edge. 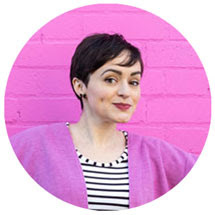 This post is part of the Orla sewalong that you can follow here on the blog over the next few weeks, or catch up with later at a time that suits you. If you haven't got your pattern yet, you can order it here!